Maxokk Bakery is a relatively small family-run bakery located a few roads away from Nadur’s main square in a side street named St James Street. 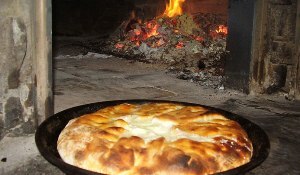 The bakery’s main claim to fame is its traditional ‘ftira’. The ‘ftira’ closely resembles a pizza at first glance; however its unique texture and taste enhance the genuine surprise and culinary appreciation of our esteemed clients. Maxokk Bakery is widely believed to produce the best traditional Gozitan ‘ftira’ on the island of Gozo. Maxokk Bakery started off around 80 years ago in the 1930s. The original owners of this bakery were Pawlu and Marija Attard but since they were getting old, they were unable to continue to take an active role in the bakery, so they handed over the daily running of the bakery to their daughter Grace. Maxokk bakery is named after the family’s nickname and is now run by the third generation of the Attard family. This nickname was given to Pawlu when he was still a young boy. He was playing with the dynamo of his bicycle when he got a slight electric shock. Taken aback, Pawlu stormed back home bellowing, “Ma xokk”, which is Maltese for “Mum, I got an electric shock”. The other boys that were playing with Pawlu all burst out laughing. The nickname was born. The bakery started baking bread and daily meals. Our previous oven was situated in another street in Nadur itself. The original oven was replaced 20 years later in 1952 by the one that is still in use today. It was common practice at the time for the locals, particularly neighbouring families, to ask us to bake their Sunday meal in our oven. Our business mainly involved baking bread. Later on, we introduced what would become our trademark product ‘ftira tal-Maxokk’. The ‘ftira’ has definitely become the flagship product that has spread our fame amongst Gozitans, and many Maltese and foreign customers. We are proud that we have managed to establish a loyal clientele over the years. The defining characteristic of our bakery is undoubtedly the old brick oven. Dry wood, generally oak is used to fuel our oven. The temperature of the oven depends on the amount of wood used and the quality of the wood. It is our pride and pleasure to prepare food with loving care in the traditional method that we have inherited from our great grandparents.